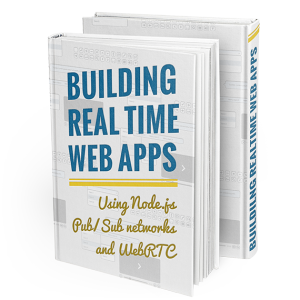 I’m writing a series over at Real Time Weekly about using WebRTC on iOS, specifically to document the research we’ve been conducting in order to release a couple of iPhone apps, based on WebRTC, under AgilityFeat’s brand. One of these apps is a remote spectrum analyzer based on real-time audio streams. In this tutorial we’ll go over the steps to build a spectum analyzer using WebGL and GLSL shaders in plain HTML and using the getUserMedia function to access the microphone. I’ve written about shaders before on my guide to using WebGL in iOS without PhoneGap or Ionic and why they’re so useful for mobile platforms. The quick version of it is that using Vertex and Fragment Shaders forces your application to use GPU (graphics chip) rather than CPU (processor) to generate graphics. ThreeJS provides a very simple API to pass GLSL Shaders to it. When creating 3D objects you can assign them different types of materials. One of the available materials which ThreeJS offers is the THREE.ShaderMaterial. In order to interact with the shaders, in this case for animation purposes, we use a few pre-disposed variables which ThreeJS exposes to us as properties of the ShaderMaterial. The two properties we’ll be looking at are the attributes and the uniforms. Shader attributes are parsed only once, which means that even though you can change their values after rendering the first frame, once rendering has begun, the shader will only use the initial value you set. Shader uniforms on the other hand are dynamic and will be re-interpreted on each frame render. Both attributes and uniforms are strongly typed, and even though you’ll see standard data types such as floats and integers, you’ll also see some GLSL specific types such as vec3 which are meant to be used for multi-dimensional arithmetic. As you can see in chart above, what I’m going to do, for simplicity’s sake, is to move the bars up and down based on the frequency data, one vertex at a time, instead of resizing them or moving just the top two vertices of each bar. I talk about vertices and not shapes because shaders work like that, applying transformations to each vertex. So I’m going to need an attribute for each vertex to hold the maximum amount of pixels they will be pushed down, and a uniform to hold a relation from 0.0 to 1.0 which I’ll modify on a frame-to-frame basis. Later I’ll take these values and multiply them together to get the final amount I will move down the vertices of each bar. The idx attribute you see there has to do with the fact that WebGL is built on top of an older implementation of OpenGL and GLSL, and as such it doesn’t provide and id to know which vertex we are looking at on each iteration. The awesome thing about using GLSL shaders is that through clever vertex-per-vertex transformations you can treat a single geometry as if it was multiple objects. Everything we've done so far is fine and dandy, but we need to tell the shader what to do with the audio data. 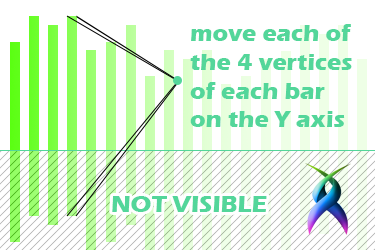 Every vertex shader is composed at least by 3 positional elements. The projection matrix (the position of a vertex relative to the camera), the model view matrix (the position of a vertex relative to the object it belongs to), and the position matrix (the position of a vertex relative to the screen). The newPosition vector holds the new Y coordinate based on the amplitude uniform we are passing it (basically the volume of the frequency this bar represents). As you can see on the fragmentShader I reuse the amp variable to get a nice fade to orange as the volume of a bar reaches its max level. The sharing of variables between shaders is possible due to the varying keyword. Be sure to drop me a line ifyou find this info helpful.